Essential Bliss, Issue #020 -- Pregnancy and Essential Oils? The answer is yes! This month, I have a special guest discussing pregnancy and essential oils. 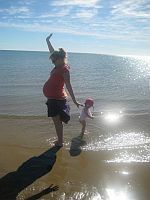 Amy Marais, a Professional Raindrop Technique Practitioner and eight months pregnant with her second child, tells us how essential oils have made this pregnancy amazingly different - and loving it! Read her story below. In keeping with the pregnancy and childbirth theme, the"Bliss" oil of the month Gentle Baby. Read on for more information about Gentle Baby essential oil. By popular demand: This month's exclusive offer for Essential Bliss readers is a chance to get a home diffuser at no cost and a copy of my book for free - read on for more details! Wishing you an gentle month! My book Lose Weight Peacefully is available now. "Finally, someone is telling my story....not all the facts are the same, of course.....but so much of those early years resonates. If nothing else, I feel as though someone else understands what I have been through and in this moment, that means a great deal and brings me a sense of peace." "Loving the book, can't believe I'm not craving food anymore!" "This is the missing piece of the puzzle I have been looking for. I wanted a non-diet approach but didn't know where to start. Now I do. Thank you." LIMITED TIME ONLY: Book includes two bonus eBooks at no extra cost. Order online now. Essential Oil Support is also included as an important part of this weight loss journey. Get your copy now to find out how. You can order the book online at www.loseweightpeacefully.com and it will be delivered direct to your door, anywhere in the world. EXCLUSIVE SNEAK PREVIEW OF MY NEW SITE DESIGN AT THIS PAGE - WHAT DO YOU THINK?! Learn Egyptian Emotional Clearing Technique Full details about the Egyptian Emotional Clearing Technique. You can also complete a course enquiry (see below in Upcoming Events for confirmed course dates). Essential Oils Questions and Problems Forum Do you have a physical, emotional or spiritual problem and want to use essential oils? Got an essential oil question you can't find the answer to? Ask your question here and Jen will answer usually within 24 hours. You are invited to experience a FREE session of relaxation, education and fun with therapeutic grade essential oils at our Essential Oils for Wellbeing Playshop. Treat yourself, indulge your senses and experience the pure and potent power of these amazing oils. Touch, taste and smell your way to wellbeing and learn how to incorporate therapeutic grade essential oils into your life. Bookings: Call Jen on 0401089233 or book here. For all enquiries and bookings please call Jen on +61 (0)401 089 233 or contact me. Next course: 24 August 2010. Exclusive to Essential Bliss readers, I am offering you a copy of my book Lose Weight Peacefully at no cost - if you join the Young Living Essential Rewards Program. If you have wanted to join Young Living and get the best essential oils in the world, but have been putting it off - now is the time! Go to the Young Living Website, choose your country and browse the many essential oils, nutrition (I highly recommend Ning Xia Red) and other products. Choose a wholesale account (independent distributor) and place your order, including your essential rewards order. It is that easy and Young Living will send to anywhere in the world. PS. When prompted for a sponsor number please use mine - Essential Oil Goddess 956246. Thanks! A special offer for Australia only. Stay on the Essential Rewards program for a minimum of 3 months and at the end of the 3 months you will receive a home diffuser at no cost! For help with ordering: Please call Jen on +61 (0)401 089 233 or please use this contact page. When Jen from Essential Oil Goddess approached me and asked if I’d like to write about using essential oils during my 2nd pregnancy, I jumped at the chance. It has been my experience that a lot of people will usually run a mile when you mention pregnancy and essential oils together! I am so grateful to have this opportunity to spread the word on how beautiful Young Living Essential Oils and their other products are to use while pregnant! It has been a great pregnancy this time round. My first pregnancy was completely different. I had not been introduced to Young Living yet and all of my aromatherapy and natural health books told me to not use any oils during pregnancy. So like many people I avoided using any oils during my first pregnancy. Instead, I tried most of the pregnancy multivitamins that are on the market, took them as directed and found that a couple of them made me feel sick, nauseous, dry reach or vomit (although I didn’t get morning sickness at all). I thought “Wow how can a multivitamin make you sick when they are supposed to help you.” After having my daughter I strived to do research and find pure and natural products for her and my family and for my next pregnancy. That’s when I found Young Living Essential Oils and Natural Products infused with nature’s goodness. I can honestly say that my life has changed in such an amazing way. I am surrounded by health, happiness and purpose and have never looked back. As part of my life changing journey, I have completed my Level 2 Certificate in Professional Raindrop Technique and run my natural therapy business (Naturally Joyous) from home. Now, I am also in my eight month of my second pregnancy and I have felt so much more energetic, alive, pain free and healthy than ever (and I’m running around after an 18 month old!). Every morning after a shower I rub Gentle Baby* on my tummy and bottom (and anywhere I feel I’m putting on baby weight) mixed with Young Living’s V6* oil (or any other good quality vegetable oil) I use about 7-9 drops of vegetable oil to 4-5 drops of Gentle Baby. This is such a lovely and soothing oil. I find it very relaxing and comforting and great for reducing stress during pregnancy. Gentle Baby also helps me with stretch marks and scar tissue, while rejuvenating the skin, improving elasticity & even helps reduce wrinkles. (When buba is born, I will also use it to help with nappy rash). Gentle Baby consists of geranium, rosewood, lemon, lavender, jasmine, roman chamomile, bergamot, ylang ylang, palmarosa & lovely rose. A couple of days ago during my antenatal appointment, I was very pleased to hear my midwife comment on how smooth and stretch mark free my belly was! Thanks to my oils, the three stretch marks that I acquired during my first pregnancy have disappeared! I also have been rubbing a couple of drops of Young Living lemon essential oil on my thighs and knees to help reduce fluid retention (which I suffered with during my first pregnancy) and stretch marks. The spider vein that appeared after my first baby has dramatically decreased, which I am thrilled about. I love lemon oil! Most nights I also put a couple of drops of Valor* on my belly before bed. This helps balance my energy helping the body to self-correct its balance and alignment. It is such a harmonising nurturing oil with the ingredients rosewood, blue tansy, frankincense, spruce and sweet almond oil. Instead of taking a "pregnancy multi-vitamin" this time and feeling sick, I have been having 30mL (1 fl oz) of yummy NingXia Red daily. This is a delicious, yet powerful antioxidant drink, that helps support immune function, liver function, eye health and increases energy (which I definitely need at the moment!) The main ingredient is the NingXia wolfberry, which is sourced only from the NingXia Provence in Northern China. NingXia wolfberries contain 18 amino acids and 21 trace minerals, these include calcium, magnesium, potassium, copper, zinc and manganese – which are all vital during pregnancy. Wolfberries contain more beta carotene than carrots, 3 times the vitamin C than raw oranges, 67 times the vitamin B1 of brown rice, along with vitamin E, Vitamins B2, B3 & B6. Wolfberries provide loads of fibre—five times more than oatmeal bread! Along with the wolfberries, NingXia Red also contains all of the essential super foods. These include blueberries, pomegranates, raspberries, apricots and dark grapes. It is also infused with extra Vitamin C and lemon and orange therapeutic grade essential oils. There have been so many benefits for me—I call it "My yummy berry liquid natural multivitamin!" It feels good to know that I’m not putting any synthetic chemicals or artificial vitamins and minerals into my body. It was actually interesting to learn that some multivitamins provide little tangible benefit since your body may only absorb a tiny fraction of synthetic nutrients. The last essential oil blend I have to mention is Peace and Calming*. Without this oil who knows what state I would be in! As one of my favorite oils, it is extremely relaxing and indulgent, when you smell this oil it sends you into another world altogether. It helps to relieve anxiousness and tension. Fantastic when you are running around after an energetic, unreasoning and stubborn little adorable toddler! It is now very close to the birth of my second child, and I can’t wait to introduce him or her to the outside world of essential oils. This pregnancy has been an amazing blessing with Young Living Essential Oils. I would love to hear from anyone has any questions about using oils while pregnant or if you would love to experience a blissful Raindrop Technique with me. I am located in Petrie, Brisbane. Important: Jen and Amy only use and recommend Young Living Essential Oils. All the information above is based on using Young Living Essential Oil - The World Leaders in Essential Oils. *Young Living Essential Oil Blend. EXCLUSIVE: Pregnancy Bliss Recipes (or anytime really!). I love working from home, you can find out more below. SBI! is an educational system so you can do it all yourself. Gentle Baby essential oil is a blend of essential oils suitable for use during pregnancy and for babies. The Essential Oils Desk Reference states that Gentle Baby "states that Gentle Baby "comforting, soothing, relaxing and beneficial for reducing stress in pregnancy...It is particularly soothing to dry, chapped skin and diaper rash. 'It can be used for massage throughout the entire pregnancy for relieving stress and anxiety, and to prevent scarring and creating serenity. Massage on the perineum to help it strectch for easier birthing." It is also an essential oil blend that can be used by anyone, young or old, male or female. It is beautiful to support any skin condition. Geranium, Rowewood, Lemon, Lavender, Jasmine, Roman Chamomile, Bergamot, Ylang Ylang, Palmarosa. For me, Gentle Baby is one of the best essential oil blends I have found for wrinkles. It is very relaxing to put a drop or two on the face before sleep and contains many skin regenerating oils. I would recommend Gentle Baby to anyone who is pregnant, had a baby, wants to work on scars, stretch marks or other marks on the body. Enjoy this beautiful smelling oil with rejuvenating properties.